Alabama's 35-28 comeback victory over Georgia in Saturday's Southeastern Conference championship game prevented Crimson Tide coach Nick Saban from having to lobby his team into the College Football playoff for a second consecutive year. 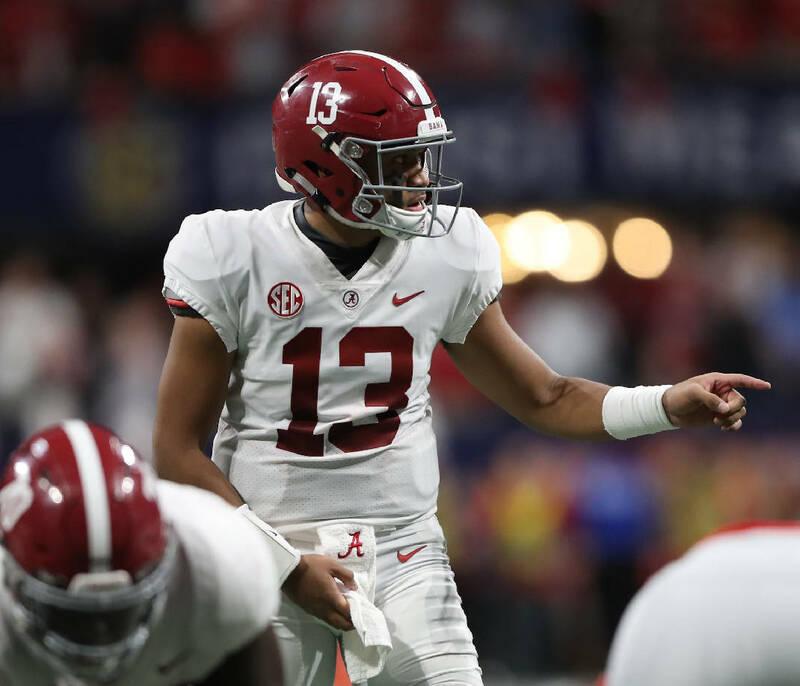 Saban is instead using persuasive talk in the Heisman Trophy race, which tightened after Alabama sophomore quarterback Tua Tagovailoa completed just 10 of 25 passes for 164 yards with a touchdown and two interceptions against the Bulldogs before exiting with an ankle injury early in the fourth quarter. Tagovailoa's interception total inside Atlanta's Mercedes-Benz Stadium matched his count for the 12-game regular season, when he threw for 36 touchdowns and posted the top efficiency rating of any quarterback in the Bowl Subdivision. "I think he's been one of the best players in college football all year long and maybe the most productive for the time that he played," Saban said. "I do think he was affected by his ankle, and it happened early in the game. That may have affected his performance to some degree." The only certainty about this year's Heisman is that the winner will be competing in the Orange Bowl on Dec. 29, when Tagovailoa and the No. 1 Crimson Tide (13-0) face Oklahoma quarterback Kyler Murray and the No. 4 Sooners (12-1). Murray, who began his career at Texas A&M and in several months will compete as a touted outfielder in the Oakland A's organization, made the most of his showcase opportunity Saturday during the Big 12 title game by completing 25 of 34 passes for 379 yards and three touchdowns in a 39-27 win over Texas. All Heisman votes had to be turned in Monday afternoon, and the Heisman Trust revealed Monday night that Tagovailoa, Murray and Ohio State quarterback Dwayne Haskins are the finalists who will be attending Saturday evening's ceremony at the Downtown Athletic Club in New York City. Tagovailoa and Murray also are finalists along with West Virginia's Will Grier for the Maxwell Award, given to college football's player of the year, and the Davey O'Brien Award for the nation's top quarterback. Those two honors will be bestowed Thursday night in Atlanta, which means that Tagovailoa and Murray will be staying quite busy in the days ahead while their respective teammates take a sizable break from practicing. "There is not any other sport where you wait a month before you play again, and you've got to be able to manage it," Sooners coach Lincoln Riley said. "You want to enjoy these things, because they are special and don't happen all the time. They take a lot of hard work to get to, but you have to keep the focus on the game and understanding what's in front of them. "I think we've got a good plan, and we've already worked through it some. We'll talk more about it and have Kyler and our other guys ready to go." These two storied programs are no strangers to awards ceremonies and especially the Heisman. They have combined to produce five of the last 15 winners, with quarterbacks Jason White (2003), Sam Bradford (2008) and Baker Mayfield (2017) representing Oklahoma and running backs Mark Ingram (2009) and Derrick Henry (2015) representing the Tide. Mayfield was a finalist in 2016 along with Sooners receiver Dede Westbrook, with each invited to New York. Mayfield also finished fourth in the 2015 Heisman balloting, but the three invitees that year were Henry, Stanford running back Christian McCaffrey and Clemson quarterback Deshaun Watson. Murray has completed 241 of 340 passes for 4,053 yards with 40 touchdowns and seven interceptions for a nation-leading efficiency rating of 205.7, and he has rushed 113 times for 853 yards (7.6 per carry) and 11 scores. Tagovailoa is 199-of-294 for 3,353 yards with the 37 touchdowns and the four interceptions for a rating of 202.3, which ranks second nationally. 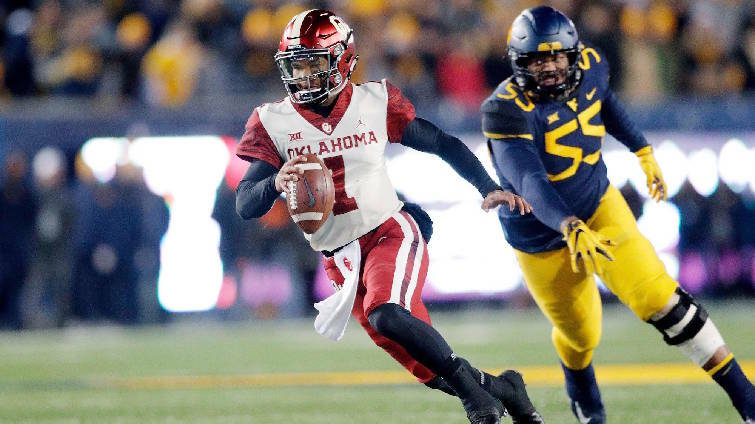 Haskins has completed 348 of 496 passes for 4,580 yards with 47 touchdowns and eight interceptions. His efficiency rating of 175.8 ranks fourth nationally, just behind Georgia's Jake Fromm. In a Heisman survey Monday involving 10 of ESPN's college football writers, Murray received 46 points to Tagovailoa's 44. Haskins received 29. "I think everybody should look at the whole body of work when they're deciding who the best player is, but I'm always going to be for our guys," Saban said. "I think he's done more for our team, and I haven't even seen all these other guys play all the time, so it's tough to make a comparison, but I sure love our guy." Alabama's permanent captains for the 2018 season are running back Damien Harris, tight end Hale Hentges, center Ross Pierschbacher and outside linebacker Christian Miller. The captains were determined by a vote of Crimson Tide players and were named Sunday night as the team held its annual awards banquet at the Birmingham Sheraton. Tagovailoa was named team MVP, while backup quarterback and SEC title-game hero Jalen Hurts won for most inspiring player.